This will be a first come, first serve basis for time slots. Players will attend their designated time slot weekly. Groups would possibly share facility space with another team. One Group uses hitting cages and other uses fielding/pitching lanes, teams would then rotate cage space after 30 minutes. 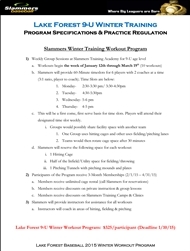 Participants of the Program receive 3-Month Memberships (2/1/15 – 4/31/15) in which Members receive unlimited cage rental (call Slammers for reservations), discounts on private instruction & group lessons, and discounts on Slammers Training Camps & Clinics. 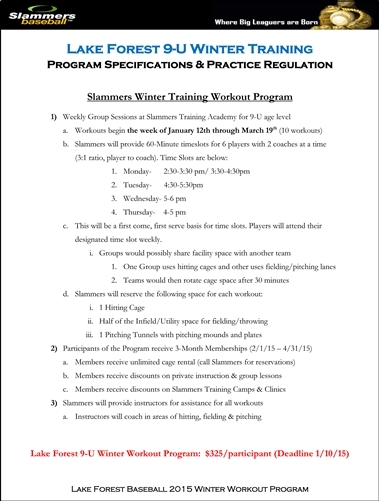 Slammers will provide instructors for assistance for all workout and instructors will coach in areas of hitting, fielding & pitching.